The front walkway of an arts and crafts style bungalow features landscaping and hardscape. 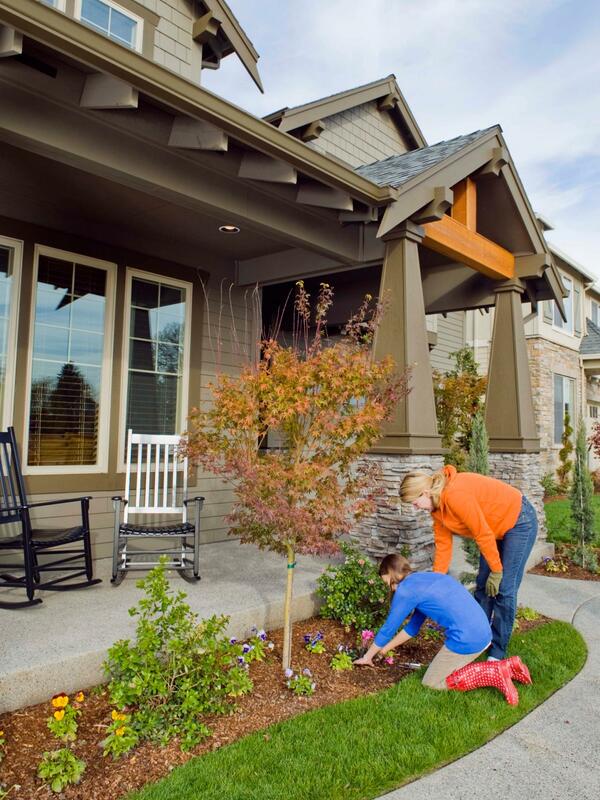 The traditional view of landscape design is a detailed drawing specifying the location of each shrub and flower bed. In truth, each time you bring home a plant from the nursery you are engaging in the design process, either intentionally or unintentionally. Judging from the results I see, there are an awful lot of unintentional designers out there. Many landscapes look like a collection of randomly chosen and haphazardly placed plants. Not only do they lack cohesion, but even worse, the poorly placed plants become liabilities, requiring expensive pest treatments, frequent pruning or complete removal long before they have fulfilled their natural life spans. 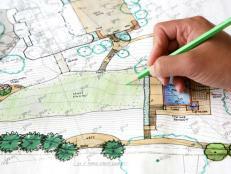 Although an overall plan is a valuable tool, there's nothing wrong with designing on the fly. Experienced gardeners do it all the time, usually with great delight. 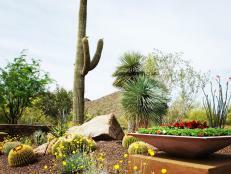 Whichever method you choose, here are a few tips for creating a landscape that stands out from the crowd and minimizes future headaches. "It's important to anticipate future access," advises Liz Dean of New Leaf Landscaping in Durham, N.C., "whether it be mowers or stump grinders, or future building projects such as a porch or patio." At some point in the life of your home, you will be faced with a project or repair that requires some loud, monstrous machine to get into your backyard. Plan for it in advance, or be faced with having to tear out some of your precious plantings. 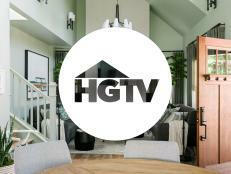 Stated simply, a focal point is something that "makes you look," says Dr. Pat Lindsey, a landscape design professor at North Carolina State University. At its best, however, "it directs you visually and makes you feel surprised, moved or engaged, moving you through the garden experience." Although we typically think of using a specimen tree or statue as a focal point, there are many other possibilities. Lindsey says the key is to find something that is "slightly to very different from the rest of your landscape in form, texture or color." It could be an architectural feature of your house or even a borrowed view. A formal landscape is one of the most challenging to create, and the upkeep can be arduous. "Symmetry is very difficult to maintain," notes Dean. If, for example, you have two identical evergreens at the corners of the house and one dies, it could be very difficult to find a matching replacement. "Sometimes," she continues, "the only choice is to replace both, which adds to the expense." One of the most common dilemmas is the hedgerow or foundation planting where one or two shrubs have succumbed to a plague. Be wary of putting all your eggs in one basket. Incorporating curves will add interest to your garden, but don't overdo it. A collection of amoeba-shaped beds would be overkill, as would a curvy path that takes you far out of the way of your destination. Long, subtle curves are often best. Lindsey also advises gardeners to "limit the geometries so that one dominates." If you incorporate curved lines in beds and walkways, for example, repeat those shapes in the third dimension with the shape of the plants you choose and the way you arrange them. On the outside chance that someone reading this has not heard the old adage "right plant, right spot," I urge you to adopt it as your personal gardening mantra. The phrase should be repeated constantly during each visit to the nursery. In addition to knowing the full-grown size, Liz Dean cautions us to consider growth rate as well. 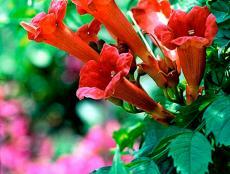 Since they get large more quickly, fast-growing plants may seem like a bargain. 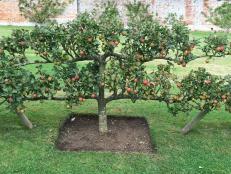 In the end, however, time and money spent on pruning and other maintenance may outweigh the initial savings. Dean also observes that "proper spacing allows air circulation to prevent fungal and insect problems." But won't the finished landscape look sparse? Easy, she counters, simply "fill in with annuals." 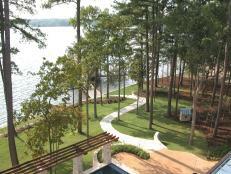 Finally, keep in mind that you needn't have a five-figure budget to achieve an exceptional landscape. Whether your landscape venture is a two-month multiphase project, or a Saturday trip to the nursery, the key is to select your plants purposefully and place them thoughtfully. The result is sure to bring you years of enjoyment. From your home's architecture to zoning laws, keep these basics in mind when planning your project. Note key elements affecting your design, like existing structures and plants, views and water issues. Follow this advice to determine if your holly is male or female. 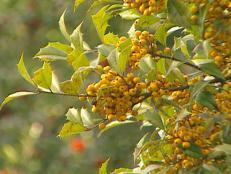 The European cranberrybush viburnum for creating screens and hedges. 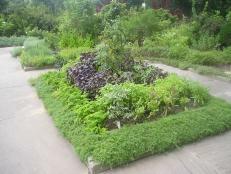 Edible landscape design brings the bounties of the harvest straight to your door.